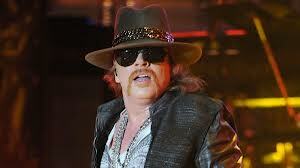 Even the picture you chose of Axl Rose is hilarious! Well done. OMG! I better get cracking on a Valentine’s gift for her then. Where’d I leave my box of crayons? I’m turning this into a check list and seeing how many I can do without being attacked. These are like when you are asked the question does this dress make look fat, we know what the answer always will be. Here’s another – I had my sister try on this lingerie first to make sure it was hot enough. Aww! A dish-soap bubble bath! How…um…hygienic? Great list! I would have to eliminate the one about re-enacting the Valentine’s Day thing though. I just posted about re-enacting the St. Valentine’s Day Massacre. So that might be a conflict of interest. This really happened: On a table at work, there was a tiny dish of those candy hearts with flowery messages. One of my colleagues and I grabbed a bunch, scratched out the messages and wrote in our own like “Bad Seed” and “Anthrax.” Oddly, nobody saw the humor in it. Oh, excellent. I’m still laughing! He’s still married to her. I wonder how much a dozen Axl Roses will set you back these days. Money is no object on a day like today. Who wouldn’t love some Axl Roses for Valentine’s Day? Nothing says love like a chubby past his prime rock legend… Can I put in an order for Meatloaf for Valentine’s Day dinner? A wise man knows what not to say just as much as what to say. But, if it was a picture of Axl Rose and Pete Rose together, then it would be EPIC. I just spit coffee at the yes your face is tattooed on my back, I’ve been trying to figure out a way to ask you out. AWESOME! and my visual for this is the big DAVE tattoo Ryan Reynolds gets on his back in the Change Up.